Give Your Kitchen Some Sparkle by Dressing Up the Backsplash! You are searching through house plans for your dream home – or maybe you’ve homed in on it already – and you excited about actually building it. If you’re like most homeowners, you are going to pay special attention to the kitchen. 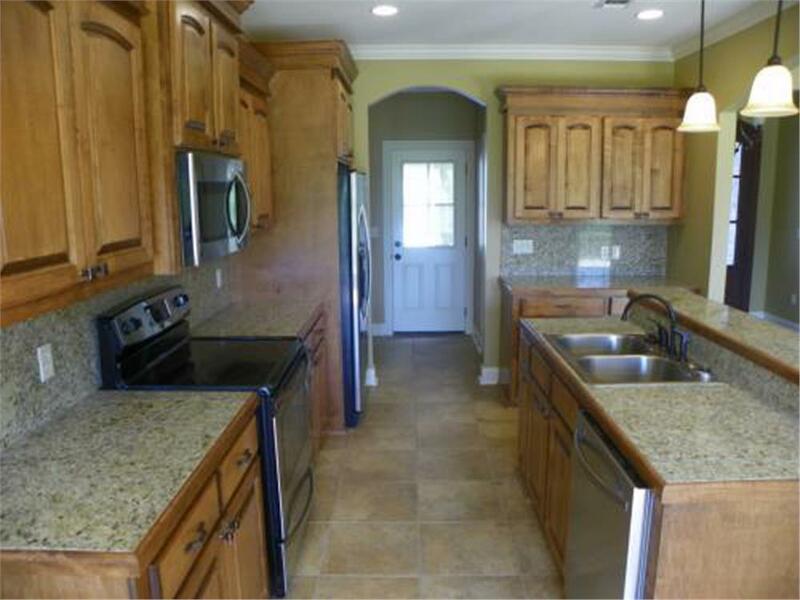 The cabinets, appliances, countertops, fixtures, and fittings will all have to be up to the task of providing you with a state-of-the-art food-preparation center, not to mention family gathering place. 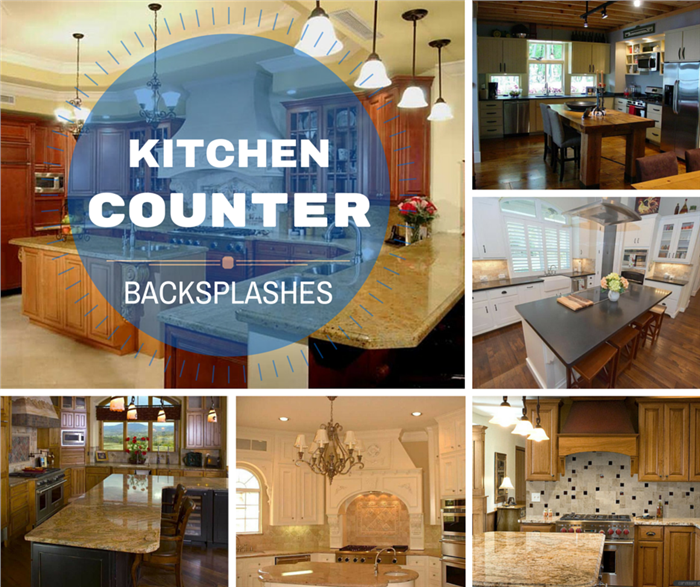 As you make your kitchen design checklist, don’t forget about the countertop backsplash! Sure, you need to cover it in tile or some other nonporous surfacing material to protect it from splashing water, spitting tomato-sauce pots, and spattering bacon grease. 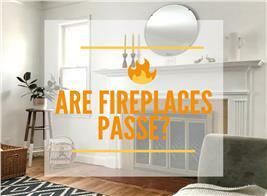 But just as important – if not more so – is the look of the backsplash. There are many design tacks you can take to spiff up the look of the kitchen by dressing up this small section of wall between countertop and cabinets. Here are a few ideas to get the creative juices flowing. Travertine, the porous limestone tile with a soft look, is common in kitchens and bathrooms alike. It comes in many shapes and profiles, so you can use it as a design element in itself to create stunning backsplashes, especially for the space above the range or cooktop, and end up with a home that has a truly great kitchen. This kitchen in a 2-story, 4-bedroom, 3-bath, and 2-half-bath European-style home plan is stylish in its white/neutal look. 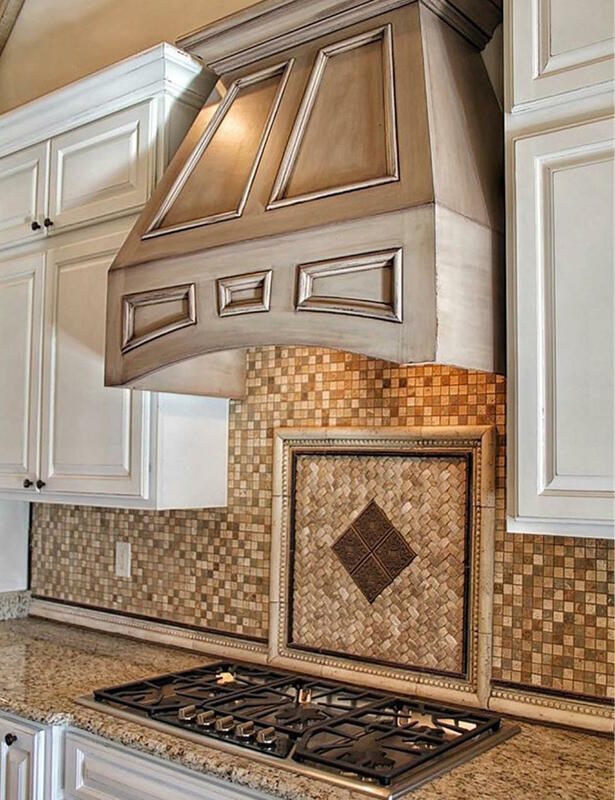 The fancy travertine tilework behind the stove and along the backsplash raises the style a notch (House Plan #134-1326). Similar to the kitchen above, this travertine treatment combines simplicity in the backsplash with more detailed work behind the cooking area. 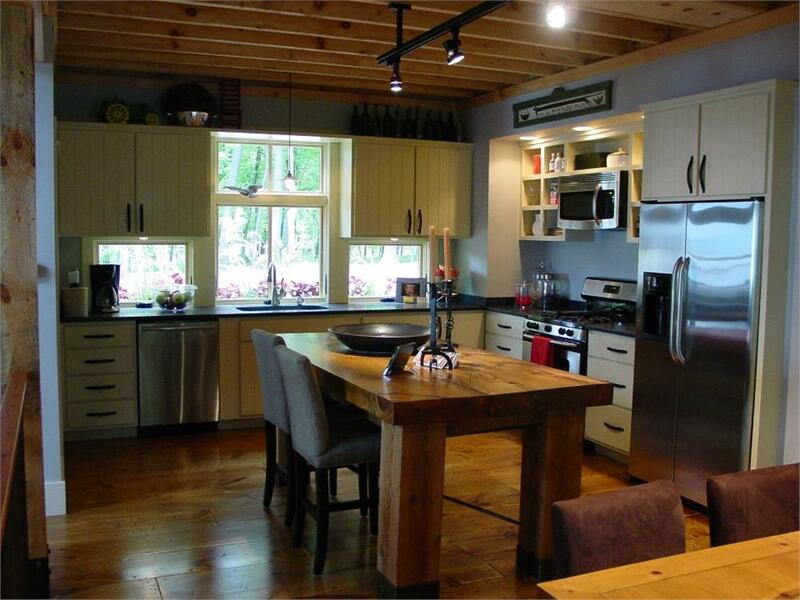 The kitchen is from a 2-story, 4-bedroom, 3½-bath Craftsman-style house plan (Home Plan #161-1036). Rather than make the – usually – expansive range area a fancier extension of the rest of the backsplash treatment, why not call it out a bit and make it stand out from the rest? Use a completely different treatment from the balance of the backsplash and make it a focal point of the kitchen! 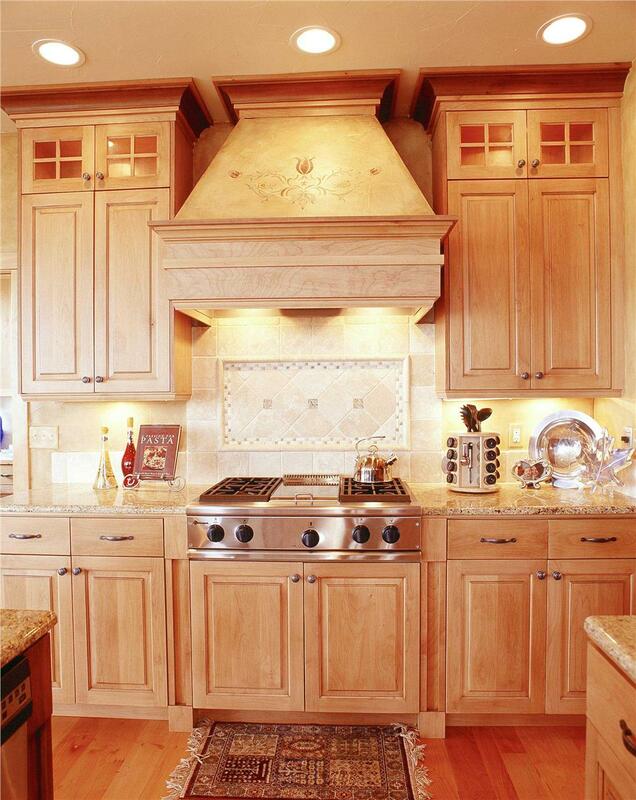 Here, the fancy vent hood and cooktop wall area call attention to themselves and become the kitchen’s focal point. The effect is emphasized in this kitchen of a 2-story, 6-bedroom, 7½-bath Spanish-style luxury home plan by the plain treatment of the backsplash proper (House Plan #107-1085). Understated can sometimes make an elegant statement. 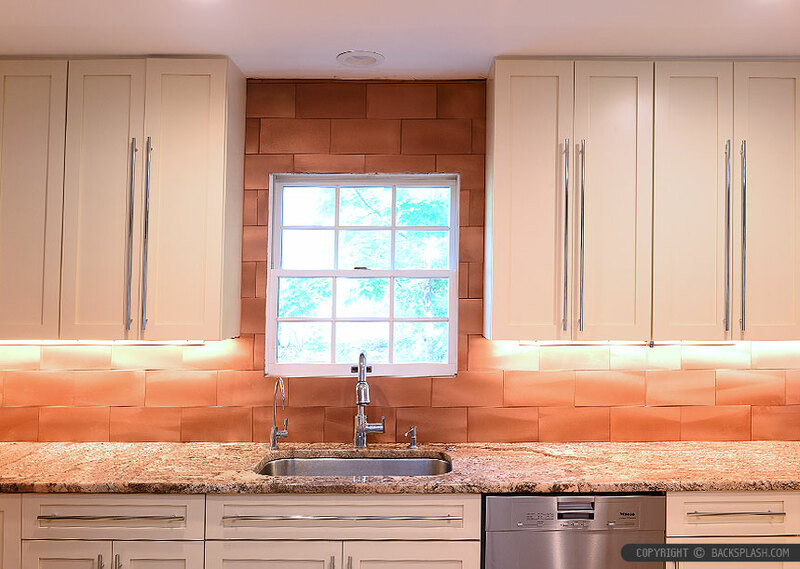 If you have simple but tasteful décor in your kitchen, why not go simple and tasteful with the backsplash by using plain stone tile without mortar joints for a stacked appearance, especially if you don’t have a range-wall area to show off? 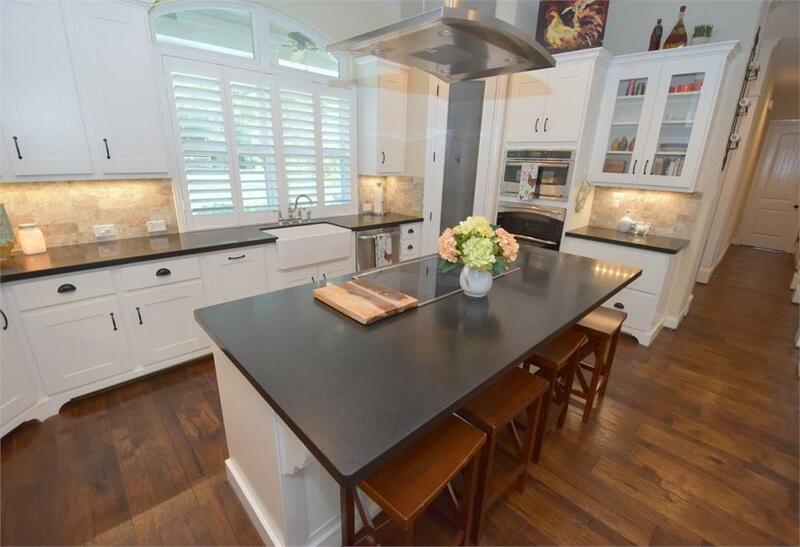 This white kitchen with black soapstone countertops is elegantly simple, with its plain stone backsplash. 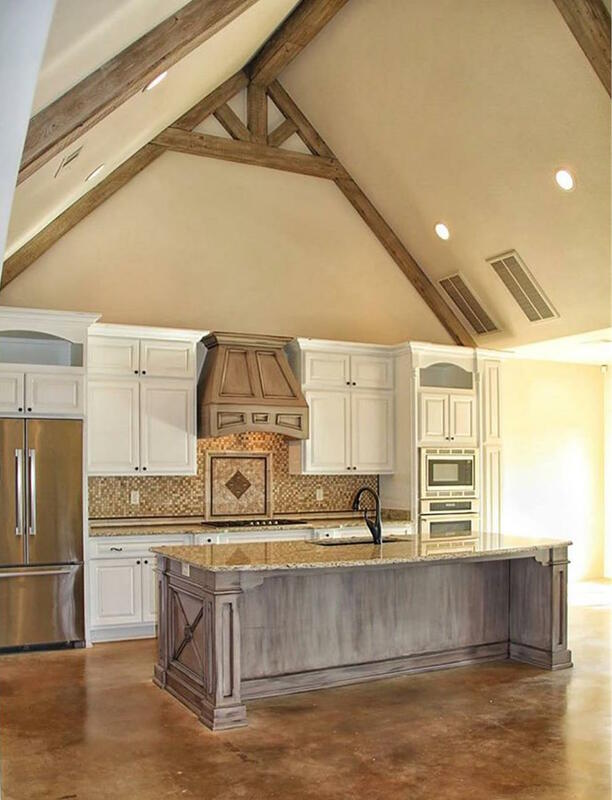 The kitchen is as sophisticated as the 3-bedroom, 3½-bath Texas-style Ranch house plan it comes from (Home Plan #106-1274). 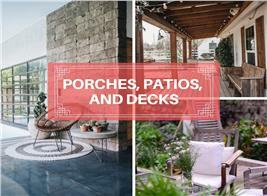 Simple décor is one thing, but some homeowners like to take it to the extreme – with easy, supremely understated and practical results. How about decking out the countertop and backsplash all in the same material? This galley kitchen in a 1-story, 3-bedroom, 2-bath French-inspired country home plan shows off its countertops and backsplash areas in the same granite surfacing material (House Plan #142-1049). How about wrapping three of the hottest kitchen tile materials together in a grand showpiece package as your backsplash? Any one of them would make a statement if used as an accent with a common-variety tile. But together? Stylish! 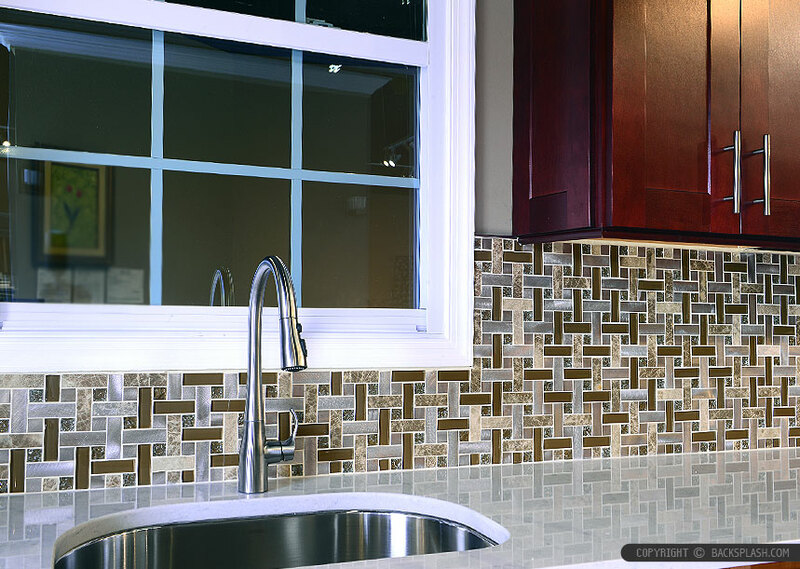 This backsplash uses rectangular and square mosaic tile in a kind of hybrid basketweave pattern. The metal, glass, and marble tile interplay for a shimmering modern effect, playing off the dark wood of the cabinets. Speaking of mosaic tile, how about using that staple of the late 1950s and 1960s is new and modern ways and colors? Mosaics are back – as accent, trim, and field tiles alike – and designers are looking at them in different ways and materials, from glass to metal. The charm of this backsplash (seen in two views) in a kitchen from a 1½-story, 4-bedroom, 3½-bath French Country-style home plan is the texture of the mosaics, especially between the field and the picture-framed basketweave area behind the cooktop (House Plan #153-1990). You can get some décor mileage from combining old materials like travertine with very modern, contemporary materials like glass tiles to give what would otherwise be a very serviceable but uninspired treatment the extra punch to make it really special. Different shades and shapes of traditional travertine tile, with square glass tiles interspersed throughout, imparts real charm on this kitchen with oak cabinetry. The past few years have seen metal really take off in the kitchen – most recently in tile treatments. Metal first made inroads as accent pieces in marble and travertine tile treatments, and now it is making its mark as dramatic field tiles! Copper-tone field tiles make a dramatic statement in the countertop backsplash of this modern kitchen with neutral cabinets. Finally, sometimes the best backsplash treatment is no backsplash treatment. Case in point: a kitchen situated on a wall of windows. There is no point to putting up a protective treatment against glass, and besides, why would you want to obscure the view? Some homeowners like to put up a traditional “backsplash,” which is essentially the same material as the countertop surface that runs up the wall about 3 inches. The balance of the backsplash area between the countertop and cabinets is finished in the same way as the rest of the kitchen walls. This kind of “backsplash” was often seen when post-formed laminate countertops were popular: the countertop and 3-inch backsplash were all one piece. 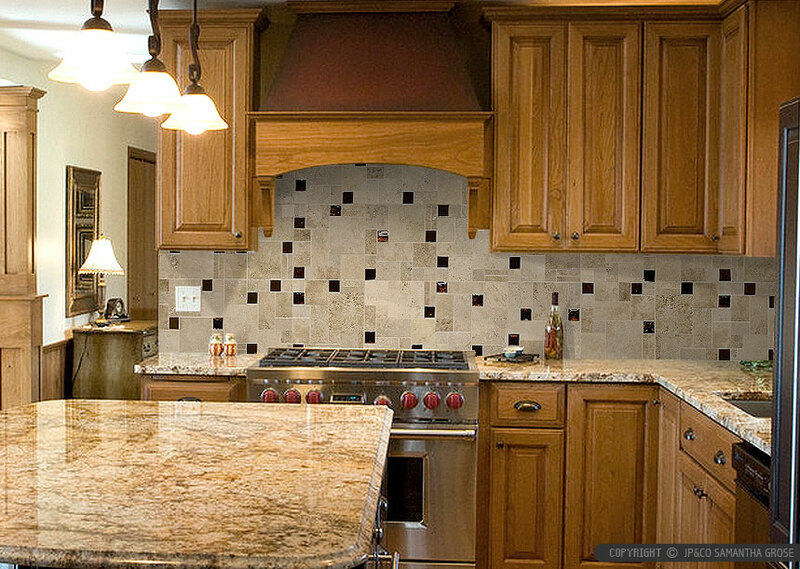 Small granite backsplashes are most often used in bathrooms. With a wooded view and pretty plants in flowerboxes as a backdrop to the kitchen, there’s no need for a backsplash treatment in this kitchen contained in a 4-bedroom, 3½-bath Contemporary Farmhouse home plan (House Plan #168-1044). With some inspiration and a touch of imagination, you can have a spectacular backsplash that completes the look of your new kitchen. Footnote: The bottom left photo in the lead montage image for this article is the kitchen of a 2-story, 4-bedroom Luxury Craftsman-style house plan. 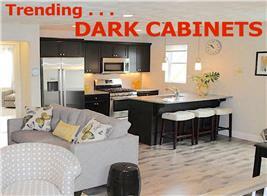 For more details, click here (Home Plan #161-1017).